I have to say that we are in love with this product! Everyday I use to see my husband’s night stand with so many cords plugged in a extention cord, it was driving me crazy! That’s why I wanted to get him this. When we received it he looked at it and said it was a great product. We been using this for about a week now and we are so glad that we have it. We have had no problems with it at all and it is helping us greatly. This product is a 5 port USB Super charger and we love that it has a blue LED power indicator and because my husband charges his phone, Ipod, and music speaker at night all at once we are glad that this product has over – voltage, over – current, and short – circuit protection. Also it states that this product is fire – resistant and high temperature – resistant chassis which is great. I have to say that this is a high quality product and is very useful at home, or at the office. * I received this product complimentary in exchange for my honest and unbiased review, regardless I only recommend products or services I use personally and believe will be good for my readers. Do You Have Dogs And Cats At Home? it's great products for portable devices. 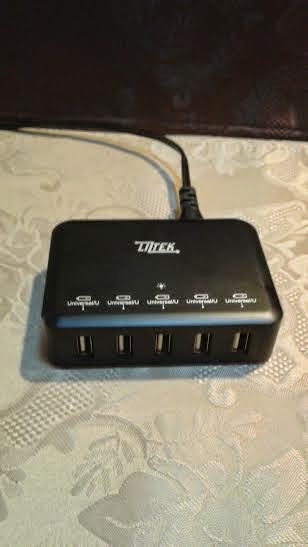 Liztek is best brand brand of USB Ports. Thanks for sharing great information. This is something that I really need.. Thanks for the chance.. This is so great- with four in the family with cell phones, and my son with his ipad- lets just say this would be perfect for our family! I love this charger. It would be so useful. This could really be beneficial in our home of electronics! Really handy to have for charging multiple different items! Thanks for the giveaway! My laptop only has two ports and I am always struggling with which one I need the most. I desperately need more ports! Thank you so much for the chance. This would solve the charging all my kids' kindles at the same time problem :-/ Right now I rotate them through one charger. this would be awesome to win. I am always charging things.